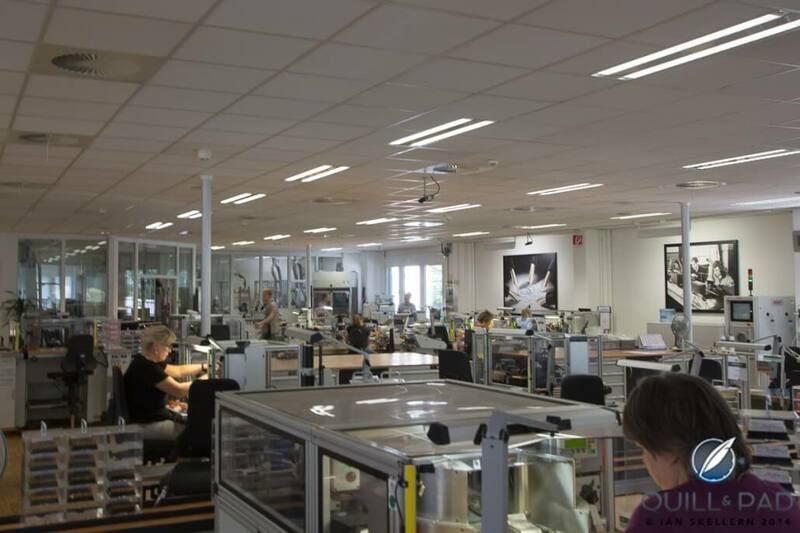 Before we headed up to Hamburg to visit what is quite possibly the holy grail of fine writing, Ian remarked that it was difficult to imagine that what we were about to see could measure up to the amount of work done by hand that goes into a wristwatch. As I had no idea of what was in store for us on this particularly sunny day in the picturesque city made great by historical Hansa businessmen, I adapted more of a “let’s wait and see” attitude. What I did know was that more than 1,000 people work in this factory. But what exactly they did was a mystery to me…though not for long. 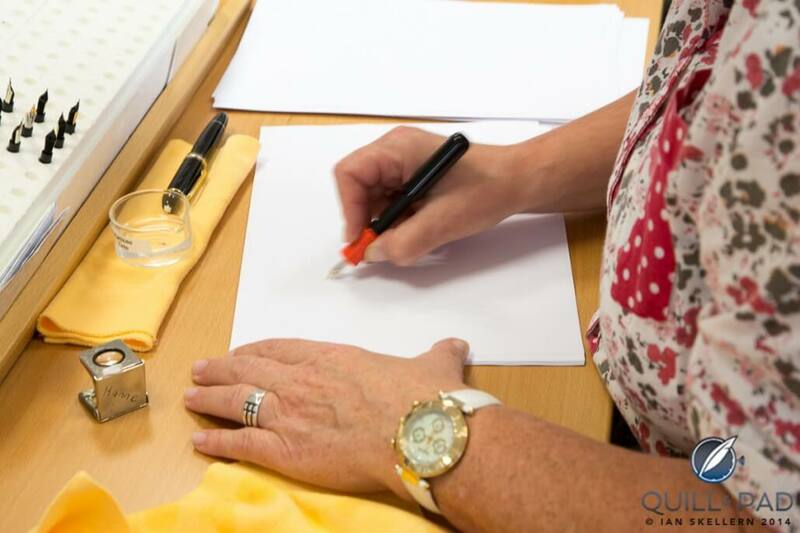 As it turns out, making the nib of a fountain pen – the point of the instrument that directs the ink – does not differ much from working precious metals to be used as watch components, but it does entail a heck of a lot of work done by hand. The nib alone needs about 40 steps until completion; making a whole pen, including barrel, cap, feed and, of course the nib, takes about 200 individual steps. Founded in 1906, Montblanc has been making writing instruments for more than a century, and I believe it is probably safe to say that this brand has it down to a science. As in watchmaking, good pens are made today using a combination of precision CNC machinery and the experienced eye and hand of the artisan. Machinery rolls, stamps and presses the precious metals destined to become nibs, while the craftsmen weld, cut, grind, engrave, and test quality. Let’s talk about a gold nib, for example. 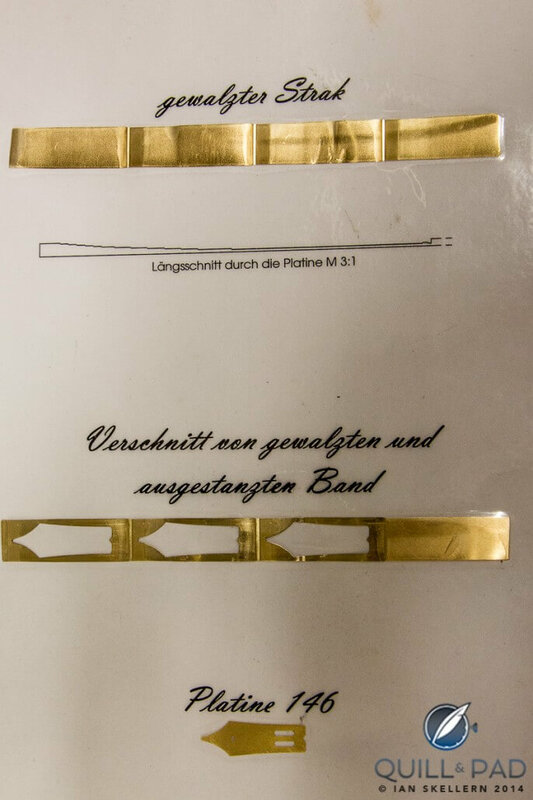 Gold is first pressed by a machine that works within a 0.02 mm tolerance to form a raw nib, which would be known as a blank in watchmaking parlance, but is called a “platine” (German for “plate”) in the world of writing instruments. Next, the platine gets a “face” thanks to a hydraulic press with 8 tons of force behind it that stamps a pattern. All stamping tools bearing the patterns of 90 years’ worth of nib-making are archived in the factory. The characteristic rounded edges are achieved by filing, which can only be done by hand. The filing is important not only for aesthetics, but also for the nib’s balance. Next, an iridium point is welded onto the gold nib. Iridium is a rare metal that belongs to the platinum family, and it is welded at a temperature that is over 1000°C. Then the nib is cut, which allows the ink to run from the feeder into a channel that heads to the iridium point, and finally onto the paper. Every nib is placed by hand in the cutter and removed again. Then one of the oldest steps involved in nib making is performed: grinding the nib by moving it in an eight shape. This step can only be completed by hand and largely resembles anglage in watchmaking. Now comes one of the most surprising and interesting steps for me, and it involves the quality control process that Montblanc has perfected. Each and every nib goes through quality control at various stations along the way. Once the pen has been fully assembled, it heads to the “writing room,” where Maria waits. Maria is a “writing expert.” Her job is to make sure that each writing instrument as a whole is exactly what it should be: that it writes cleanly and smoothly, that the ink flows evenly, that the nib even makes the correct sound as it moves across paper, and that the entire product lives up to its name. To this end, Maria fills 90 percent of the writing instruments that Montblanc makes with colorless ink and puts them through their paces. This way, the pens remain “unused,” yet have been through final quality control. Maria tests the other 10 percent with regularly colored ink. Only about two percent of the entire production gets sent back for correcting. According to Montblanc, “your hand is a fingerprint”: every person has an individual way in which he or she writes. This is the reason that Montblanc offers eight nib sizes – ranging from extra-fine through to OBB (oblique double broad) – in the standard collection. The variation in nib size compensates for people’s individual variations in pressure, speed, rotation and the angle at which they hold the pen. Since 2011, Montblanc has also offered a bespoke nib service, which allows room for individual expression. Montblanc’s most famous collection is called the Meisterstück (German for “masterpiece”). In 2014, the Meisterstück turned 90 years old. This collection first presented in 1924 is characterized by timeless design (perhaps somewhat like the Rolex of the pen world? ), continuity, use of the finest materials, and manufacture by some of the world’s best craftspeople in their fields. This classic writing instrument is even part of the standing collection of the Museum of Modern Art in New York. By the time Ian and I had left the factory, which is, by the way, beautified by a continuously growing collection of art, each work of which contains the Montblanc star somewhere in it, and a museum full of historical Montblanc pens, we had a new appreciation for both pens and Montblanc. For more please visit www.montblanc.com. Thanks for a very interesting article, Elizabeth. I have always admired Mont Blanc for their writing instruments. I never realized how much went into the production of the nib. Unfortunately, being left-handed, I have never used a fountain pen. I have one of their ballpoint pens which I really like. Thanks for reading, John! I’m sure that Montblanc now has fountain pens and nibs for left-handers. We’ll be posting a story on the brand’s bespoke nib service soon, which I’m sure you will find especially interesting. Thank you for this beautifully written and well presented article. The art of hand writing is one that is being lost day by day, and exquisite writing devices like those Montblanc produces makes the art come back to life in grand fashion. I have picked up, cleaned up, and began to use my Meisterstuck 149 again after a ten year absence; and it is wonderful!